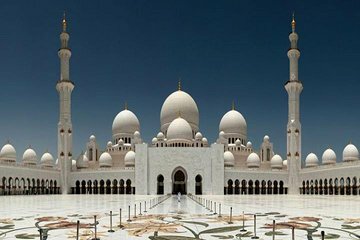 This full-day tour to Abu Dhabi hits the most popular sites and attractions in the capital city. Spend an hour exploring Sheikh Zayed Grand Mosque on your own, then visit Heritage Village, a recreation of a traditional desert camp with cultural activities and crafts. Drive along the Corniche, visit date and carpet markets, snap photos at Ferrari World, and much more. The tour were supposed to begin at 9:00, but we didn't leave Dubai city until 10:30. We just sat in the bus and waited and waited. The bus was very old, and there was so much noise, that we couldn't hear the guide speaking. We didn't have enough time at the big mosque - we had only 30 minutes to see it all. great tour just didnt like the buffet restaurant we had lunch in. I really wanted to go to a place where we could choose what to eat. overall very excited to go to this great city.